Summary: Auggie wants to be an ordinary ten-year-old. He does ordinary things – eating ice cream, playing on his Xbox. He feels ordinary – inside. But ordinary kids don’t make other ordinary kids run away screaming in playgrounds. Ordinary kids aren’t stared at wherever they go. Wonder is a book that i’ve been meaning to pick up ever since it came out in 2014, and the final push to get me to read it is the fact that it is soon to be a major movie. The trailer looks incredible and the cast is made up of some very talented actors, so i started the book in anticipation for the movie. 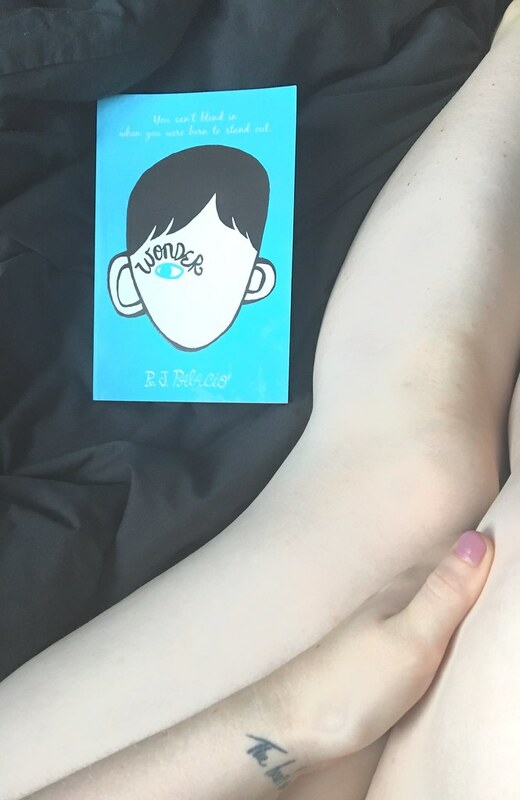 The story is based upon August, a young boy who was born with a facial abnormality that stops him from leading a life every other young boy could. People stop him in the street, point, laugh, are shocked, absolutely every reaction you can imagine happens to August. And then he goes to school for the first time. Wonder takes us through Augusts first year at school and the friends (or not so much friends) he makes. The one thing i really did love about this story (that i didn’t expect at all) was the numerous points of view. Each ‘part’ was separated in to a different voice. So we started with August telling his story, and as we got further in there are chapters from his sister, Olivia, her boyfriend, Augusts friend’s Jack and Summer and a whole host of other people. What made it even more special was that none of the chapters were told from an adults perspective. I think this enhanced the message behind the book about how children process information. I wasn’t sure when i started reading about the middle-grade aim for this novel. I’m not a very big middle-grade reader as i don’t usually enjoy it. However, this didn’t read as a middle-grade – most of the time. August’s story has a very serious and touching message behind it, and i think to aim a book about something so important at children 13 years and younger was very clever. However, saying this, Wonder is easily the most accessible middle-grade novel i’ve read for anyone. It’s such an easy read you forget that it’s targeted so young. The writing itself for me was quite average. I enjoyed the story enough that i was hooked and read it over just a few days (this isn’t very long for me at all), however there were a few niggles in the writing that pulled my concentration from the story and bothered me a little bit. It’s frustrating when you’re reading such a wonderful story and something so little as a punctuation mark can shift your focus. Overall, i did really enjoy this book. It kept me entertained throughout and i would recommend it, however not life changing. It’s such a different kind of story and something that’s not written about often, so this is definitely one of the well written ones that’s worth a read. I cannot wait for the movie release later this year. What a lovely review; it sounds like a great story!